People need the basic materials for life. They need the chance to satisfy their physical and psychological needs. They can then make choices regarding how they live healthy and happy lives. 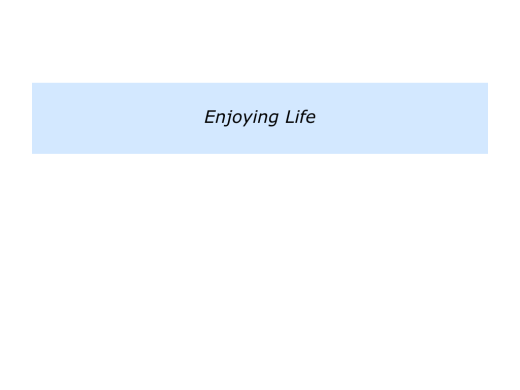 Some people seem to enjoy life. They count their blessings, appreciate life and also give to other people. They also find solutions to challenges and overcome setbacks. Some people seem to endure life. They seem to find life heavy. They may feel down about their relationships, work or other factors. 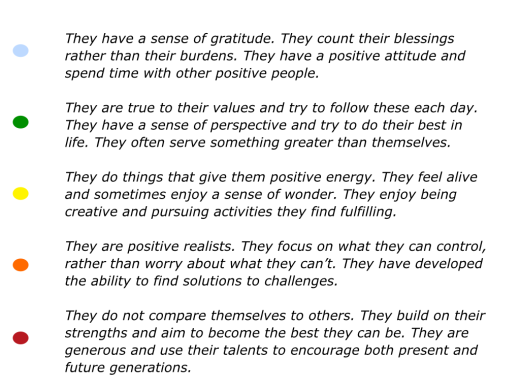 They may find it difficult to develop a positive attitude or find ways to appreciate life. Different people choose different attitudes to life. Some seem able to bounce back from even the greatest of setbacks. Some seem to find this much harder. Robert Thurman is the Professor of Indo-Tibetan Buddhist Studies in the Department of Religion at Columbia University. In the video below he describes how we can help others by focusing on happiness, even in our darkest hours. Some people are so full of angst, he says, that they create bad vibes around them. This does not help anybody. It is important not to give in to the forces that have created, for example, the planetary problems. Robert repeats the importance of beginning with ourselves. This is the best place to start expressing a positive spirit. Here is the official introduction to this Big Think interview. To do more of the things you enjoy. To spend time with the people you enjoy. To do satisfying work that you enjoy. Taking these steps will increase your strength to deal with challenging situations. It will also increase your ability to give to other people. 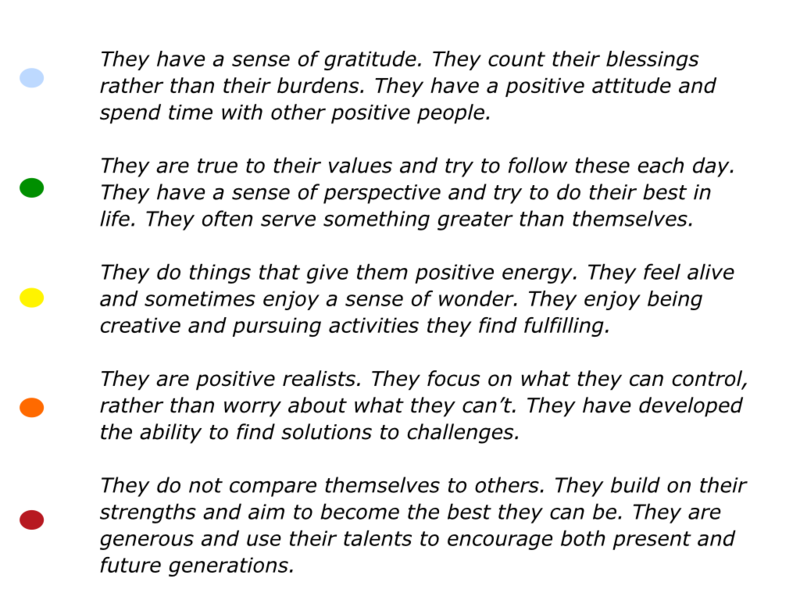 Another approach is to learn from the characteristics of people who are happy. It is then to follow these principles in your own way. The recent work on happiness was inspired by psychologists such as Martin Seligman, who wrote Learned Optimism and Authentic Happiness. Later he would express reservations about the term happiness. Since then he and other researchers have used terms such as wellbeing, flourishing and life satisfaction. 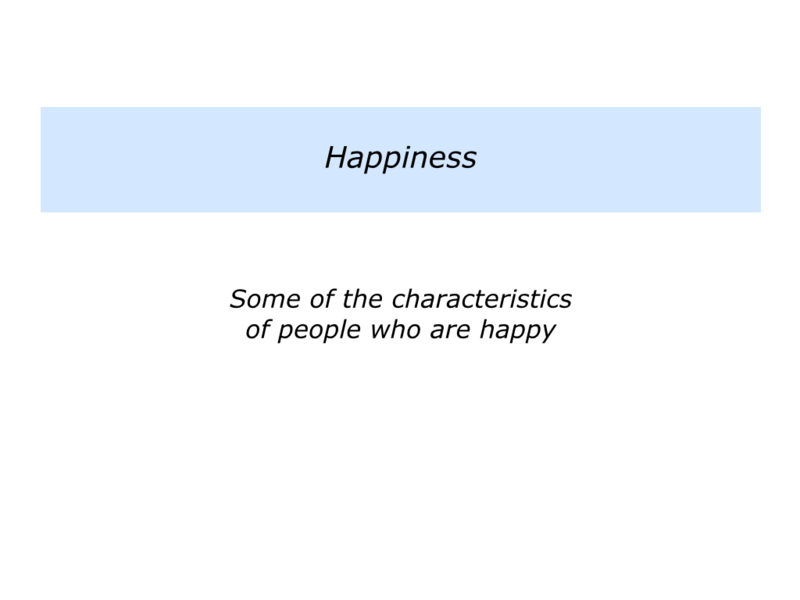 But many people continue to refer to the approach as focusing on happiness. The researchers who explore this and related topics include Ed Diener, Robert Biswas-Diener, Sonja Lyubomirsky, Tal Ben-Shahar, Barbara Fredrickson, Tom Rath and many others. Here is an overview of the principles that have emerged. You will, of course, have your own views on themes that could be added. 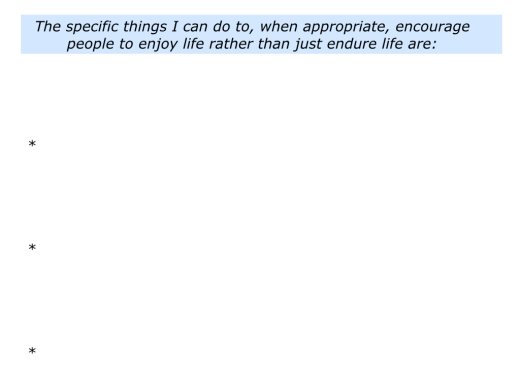 If you wish, try tackling the first exercise on the theme of enjoying life. This invites you to do the following things. 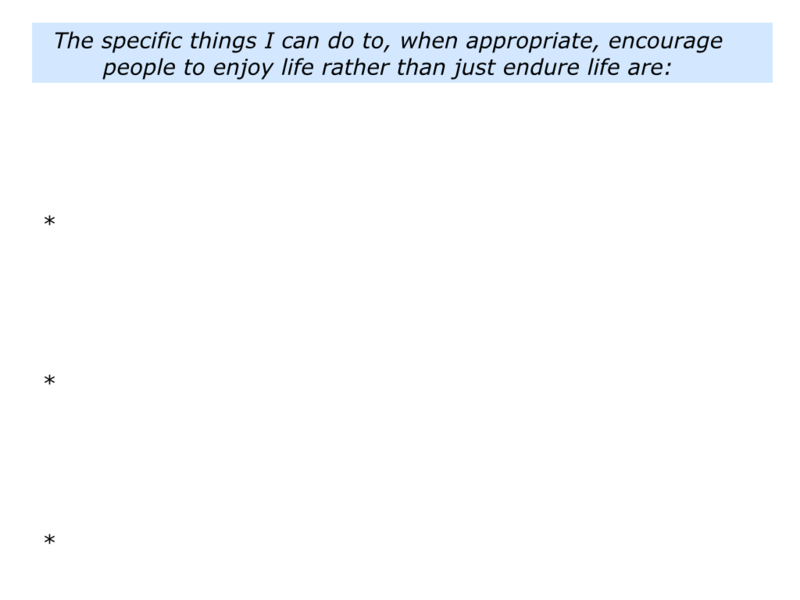 Describe the specific things you can do to enjoy life. Looking back, when have you dealt with a situation in which you were enduring life? You may have been in a difficult relationship, feeling depressed in work, hard pressed for money or whatever. What did you do right to deal with the situation? What were the principles you followed? How can you follow these principles – plus maybe add other skills – to deal with similar situations in the future? Different people choose different ways to deal with such challenges. Here are some options they may pursue. Each option has consequences. They may choose to stay in the situation and continue to behave in the same way. They may choose to develop strategies for managing the situation in a more beneficial way. They may choose to move on and put themselves in situations that are more enjoyable. Let’s explore one possible difficult situation. Imagine that you enjoy your job as an account director for clients. During the past six months, however, you have spent most of the time working with a difficult client. Despite you giving good service, the client has a pattern of criticising you and your company. This has resulted in paying a heavy price. You have lost energy for your job and have to steel yourself to visit the client. It has now got to the point where you are considering leaving your employer. Let’s consider your options. Whilst these apply to working with the client, the principles can be applied in many other situations that you endure. People like to feel in control. They like to feel they have the ability to shape their futures. 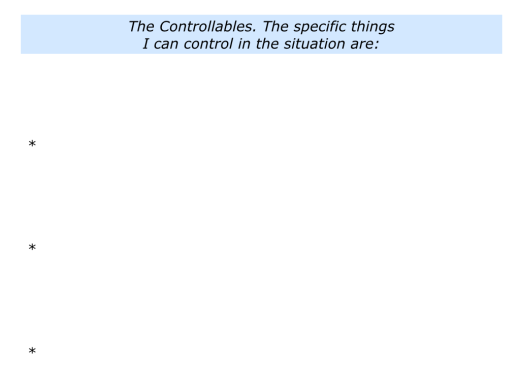 But what happens when you experience situations in which you feel out of control? Positive people then aim to control the controllables. They build on what they can control and manage what they can’t. Bearing this in mind, what can you control in the situation with the difficult client? You can control your attitude, professionalism and preparations for each interaction with the client. You can’t control how the client will react or their opinions about you. People often try to do their best to build on the things they can control. If there are not enough controllables, however, the situation can become oppressive. That is when many people choose to move on. Imagine that you want to explore the potential options for going forward in the situation with the challenging client. This takes you to the next step. Let’s explore the options for dealing with the situation. Here are some of the potential routes forward. These include the pluses and minuses of each option, together with the potential attractiveness of each route. You can continue working the client without changing anything. The pluses include that you will continue to get a salary and also know what to expect from the client. This may not make things easier, but at least the transactions will be predictable. The minuses include continuing to experience pain, because the client will probably not change. You may take the pain home and this will affect your personal life. You can be professional and prepare properly for every interaction with the client. This may include clarifying the script you want to follow and finding ways to buy time if the situation gets difficult. The pluses include you feeling more in charge of the interaction with the client. Even if they throw a curve ball, you will have a technique for buying time and getting back on track. The minuses include the need to prepare properly, which will take a lot of time. Whatever you do, however, the client may revert to type. They may continue to criticise you and your company. You can make a contract with your company that you will continue with the client for another three months but then want to move on to other clients. You will take responsibility for finding the new clients and ensuring they produce more income than the present client. You will also, if appropriate, help anybody who takes over the present client. The pluses include feeling more alive and fulfilled in your work. You will also aim to bring in more income from the new clients than comes from the present client. The minuses include the company maybe not wanting you to stop working with the client. They may count on this income stream and may not see how it can be replaced. Anybody taking over from you would need to know the client is challenging. If they chose to move into the role, you would need to support them during and after the transition. It nobody wants to take the client, then the income stream may be lost. You can begin exploring options for working in another company – or starting your own business – acting as a trusted advisor to the kinds of clients with whom you work best. The pluses include doing satisfying work and building good relationships with the clients. This could lead to increased income streams for your company. The minuses include the hard work needed to move to a good company or to set up your own business. If you join another company, it will mean investing a lot of time in building relationships and gaining credibility. You may come up with many more options. Whatever ideas you generate for tackling a particular situation, it can then be good to take time to reflect. Different people have different techniques for letting the ideas settle. They may choose to sleep, exercise, talk with other people, potter around or use other methods. At a certain point, however, it can be useful to move on to the next step. Looking at any challenge, you will need time to reflect on the potential options for going forwards. Good decision makers often focus on the consequences of each option rather than just the options themselves. Imagine you are tackling the challenge of dealing with the client that continually reverts to criticising you and your company. There may be different reasons why they behave in this way. The client may believe it is the best way to get suppliers to work harder. They may work for a business that has this attitude to all suppliers. Or they may simply be a glass half empty person. Whatever their motives, however, there are consequences. These may include you feeling that the situation is not sustainable. You can settle on your chosen way forward and make a clear action plan. Whichever route you choose, it can be good to build in some quick successes. These will provide you with the encouragement and energy to work towards your goal. It will also be vital to prepare the ground properly. If you plan to move on from the client, for example, this will involve having a conversation with your employer. Such a conversation can come as a shock, so it will be important to clarify the script you want to follow. You will also need to act in a professional way and show a positive way forward for the company. It will take time to prepare properly, but doing so will increase the chances of success. You can rehearse the conversation with your employer and prepare for any potential questions. It is also vital to have back up plans to deal with any eventualities, such as the employer getting upset or refusing to countenance your ideas. Bearing in mind your action plan, you can take the first steps and, wherever possible, get some quick wins. You can then work to achieve your picture of success. If you wish, try tackling the exercise on the theme of dealing with such difficult situations. This invites you to do the following things. 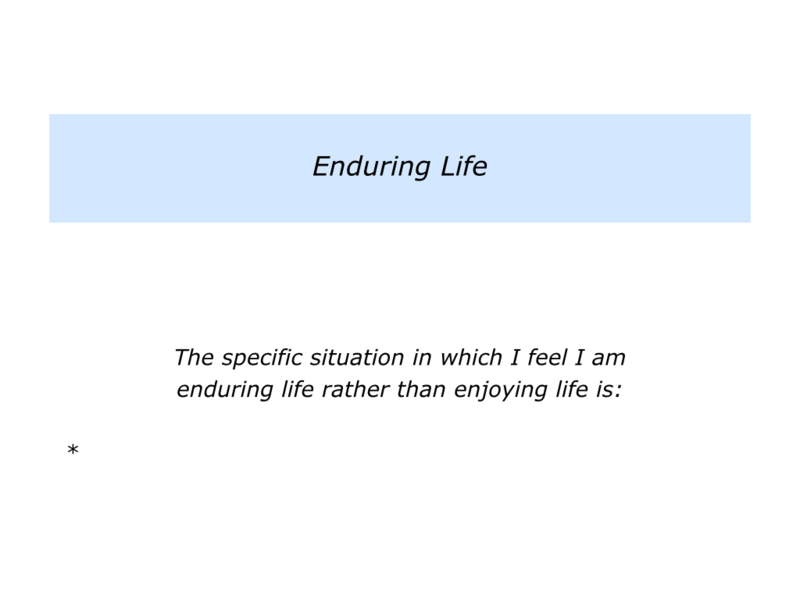 Describe a specific situation in which you are enduring life rather than enjoying life. 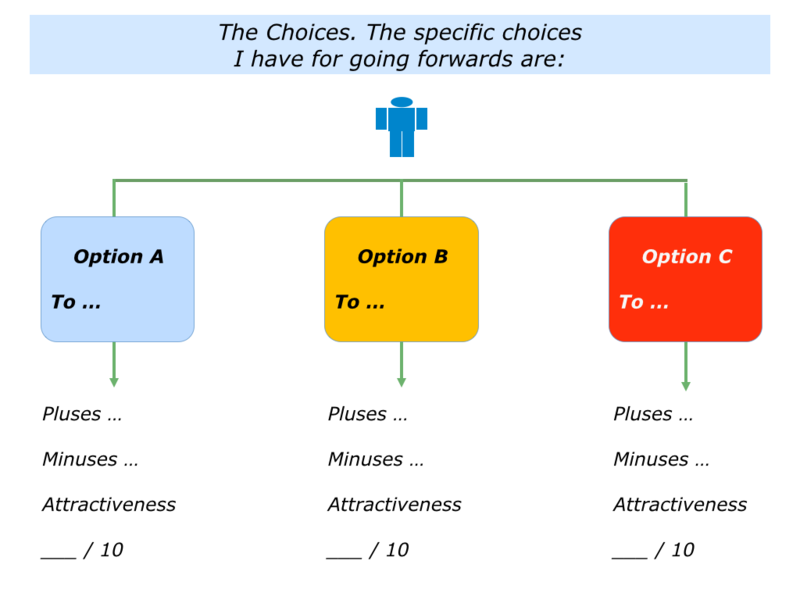 Describe the specific choices you have for going forwards and the consequences of each option. 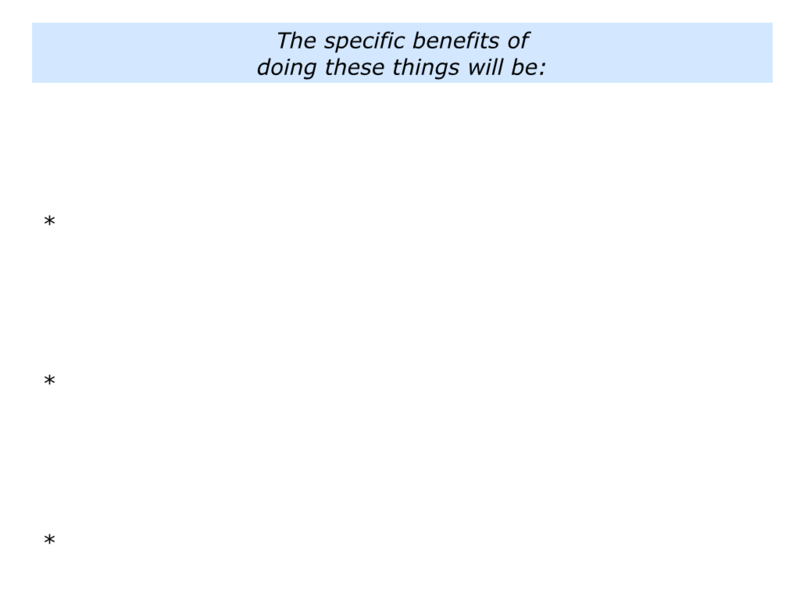 Describe also the attractiveness of each option. 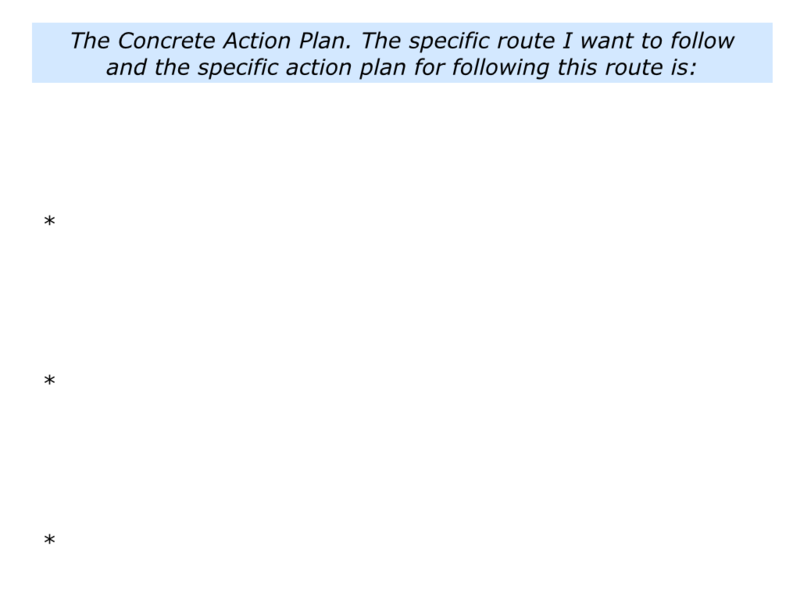 Describe the specific route you want to follow and the concrete action plan for making this happen. Many people want to encourage others, but it is vital to understand what they can and can’t control in such situations. They can encourage other people in both practical and psychological ways, but they cannot force others to accept what they give. 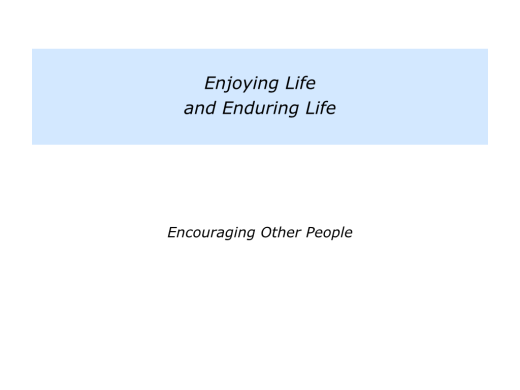 Rick Snyder described many practical ways to encourage people in his book The Psychology of Hope. He described two aspects concerning a person’s ability to shape their future. These are will power and way power. Imagine that you are normally a positive person. Sometimes you may feel confused or depressed, however, when facing a difficult challenge. 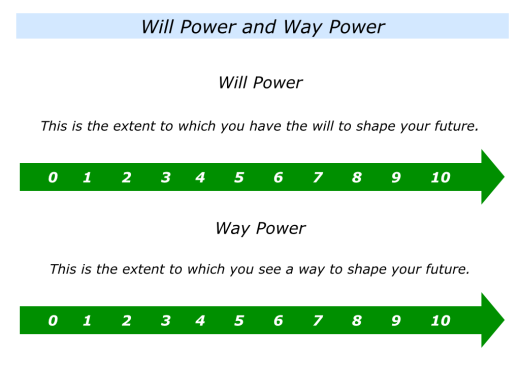 You may score highly – such as 8+/10 – on having the will to solve the problem. But you score lowly – say 3/10 – on seeing a way to solve the problem. Hence the feeling of depression. Once you see a way through the problem, however, the cloud evaporates. Your sense of hope returns and you feel reinvigorated to tackle the challenge. 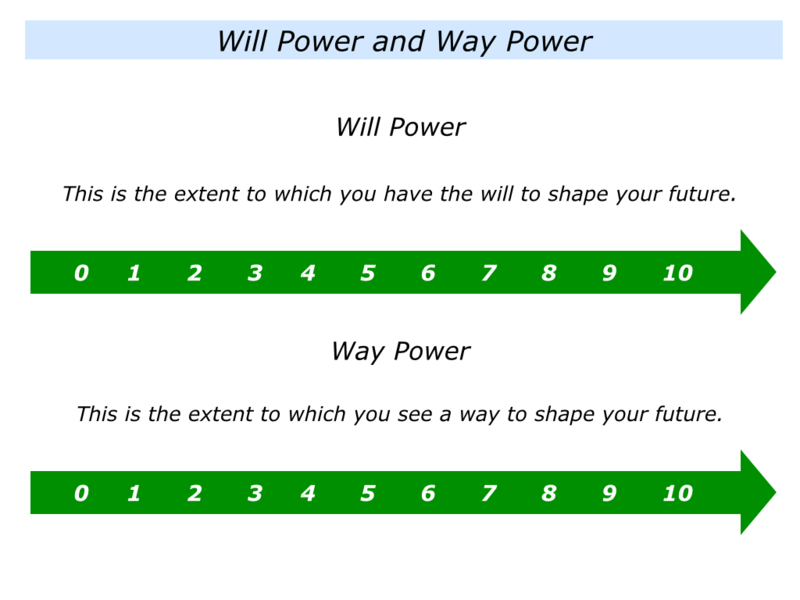 We are often told that: “Where there’s a will, there’s a way.” But this phrase can be turned around to say: “Where there’s a way, there’s a will.” If people see a way forward, they are more likely to develop the will to make it happen. Good encouragers help people to expand their repertoire of choices. This increases people’s freedom to shape their futures. 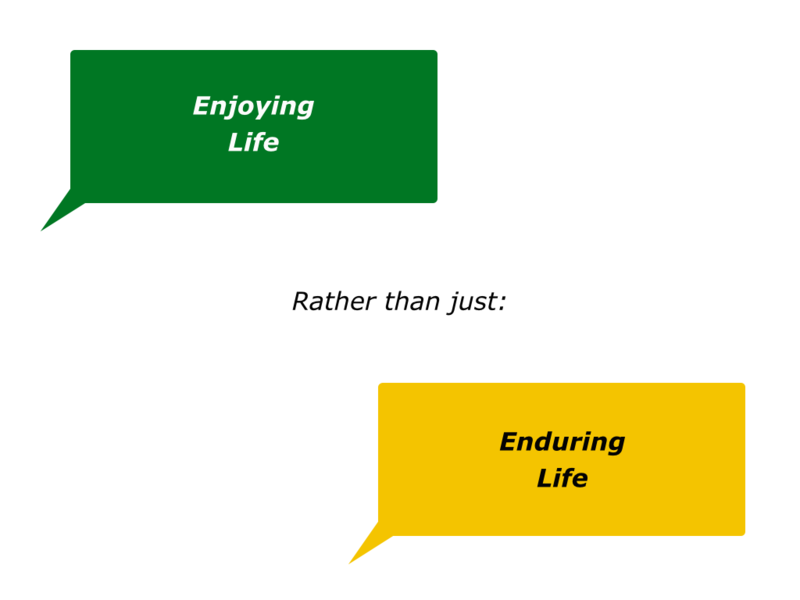 If you wish, try tackling the final exercise on the theme of enjoying life. This invites you to do the following things. 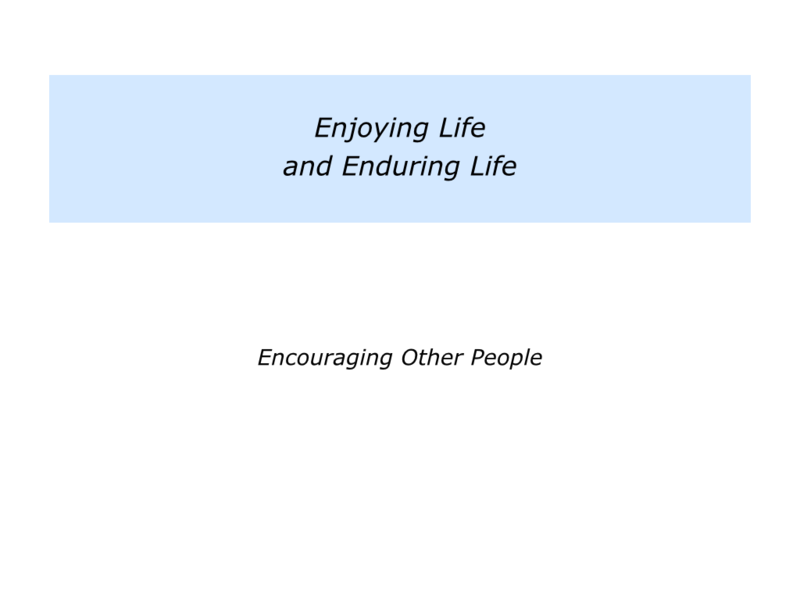 Describe the specific things you can do to, if appropriate, encourage people to enjoy life rather than just endure life. 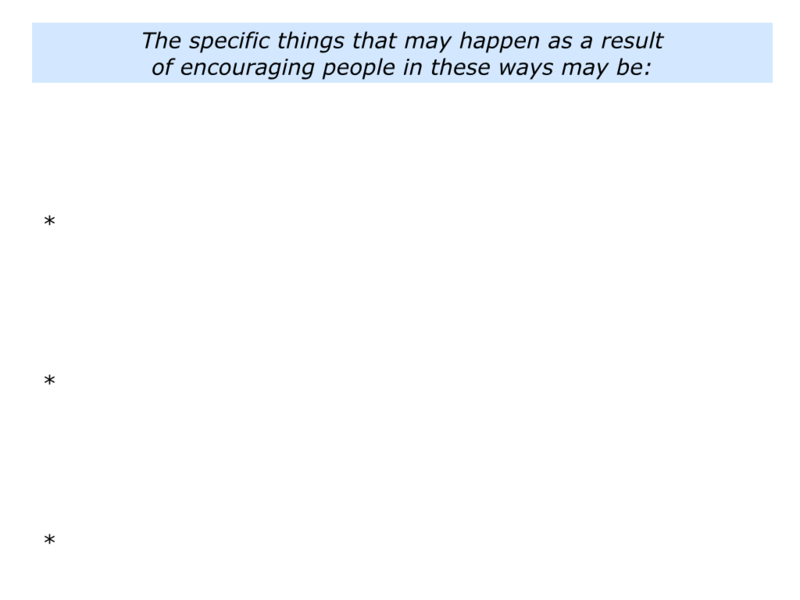 Describe the specific things that may happen as a result of encouraging people in these ways.